Some people revel in being a big fish in a small pond. But real fish stuck in a real pond probably aren’t as happy about the situation. 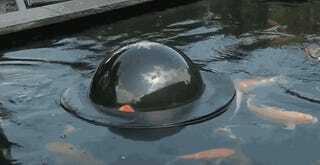 So to make the Koi swimming around in your backyard a little happier, consider upgrading their pond with this floating dome that lets them actually swim above the surface of the water and see the world outside their underwater home. At $200 it’s an expensive way to pamper your fish, but people spend far more than that on their dogs and cats. And fish don’t need to be walked and never demand bathroom breaks just as you’re getting ready for bed. As far as pets go, they give far more than they take, so why not spoil them? At 31-inches across the dome provides plenty of room for even a couple of fish to swim up and take a peek. And you can easily train them how to use it with a bit of food pushed up and under the dome so it floats to the top, enticing your fish to enter. But like with aquariums, tapping on the glass (or plastic, in this case) is probably not a great idea.